GFRC cladding, paneling and other modular architectural elements from Stromberg Architectural Products arrive as separate, yet largely identical, patterned sections. In order to avoid too much pattern repetition, it is important to assemble the individual pieces properly for a more natural appearance. Some detailing assembly methods are meant purely for aesthetic effect, while others are more utilitarian and are meant to safeguard against the effects of weather and other external elements. It is important to follow the specific instructions for your exact GFRC project. However, while every job will be different, several basic rules apply to any effort to detail GFRC for fabrication. One thing that should always be avoided is pattern repetition. It can be challenging to make modular fabrication look natural, but a keen eye for detail and the simple act of offsetting panels can make a big difference. Again, it is critical to follow the particular instructions for your precise GFRC project, but if the product you’re fabricating might be exposed to the weather, it is important to take that into consideration. Detailing GFRC for weather is, in some ways, similar to shingling. Whenever possible, try to provide a small amount of overlap between sections so as to protect whatever cladding is on the other side. 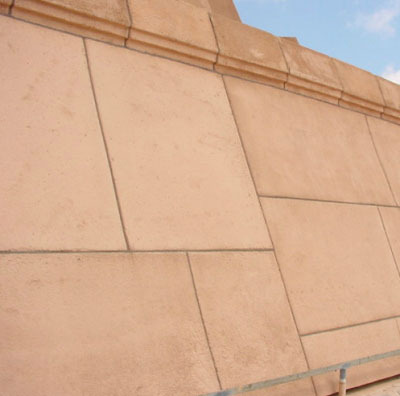 Additionally, products which emulate brickwork, stonework or shingling should always avoid long runs of sections terminating on the same line – this will help to redirect rain or other liquids and keep them from seeping into the architecture. In addition to the use of metal flashing, it is important to avoid gaps between sections of GFRC material as much as possible. To this end, it can be helpful to overlap sections whenever possible as long as it does not offset the seating of the section. Also, as with siding, it is important to avoid any long runs where seems meet on the same line by alternating placement of sections as much as possible. Again, it is most important to follow the specific instructions for any given GFRC product, but these general guidelines should be helpful to keep in mind as you detail your GFRC for fabrication.